Meat-free marriages are firmly on the agenda this year & it’s a movement we at Rare are very much part of. Our gourmet, vegan & vegetarian menus are a far cry from the old clichés of beetroot & goat’s cheese & risotto (often made with Parmesan which is NOT vegetarian!) These old chestnuts are still cropping up as a the veggie offering on too many menus. Our colourful, seasonal, inventive & utterly delicious vegan & veggie dishes mean that the fully vegetarian weddings we cater are embraced by all guests including the most hardened of carnivores. 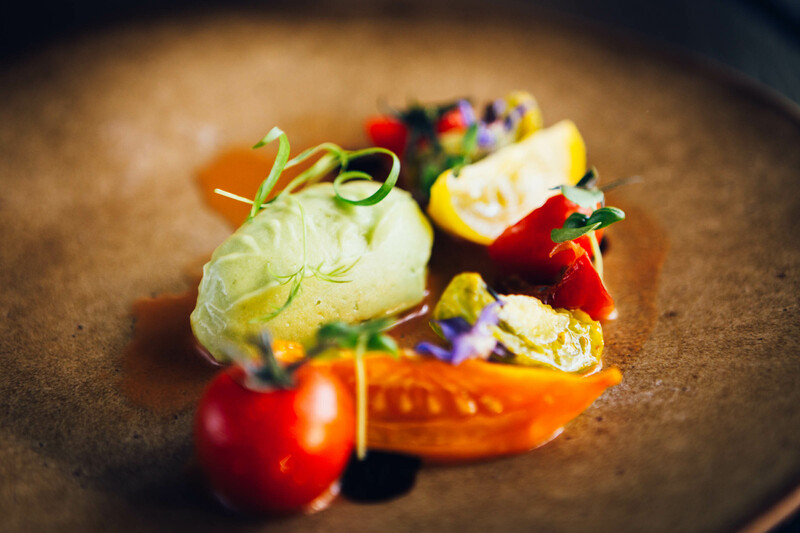 Dishes like our vegan asparagus and king oyster mushroom salad, confit tomato, truffle dressing or tomato gazpacho, semi dried heirloom tomato, avocado sorbet (pictured here) are fine dining delights & vegetarian mezze or crostini boards are more hearty, but still stunning, sharing alternatives. We also offer tasty sharing main dishes like Thai cauliflower larb & vibrant sides dishes or salads such as roast carrot spelt dukkah with lemon tahini. All our menus are bespoke and we will work with you to create your perfect veggie wedding breakfast. Get in touch with us to discuss your vegetarian marriage menu à la mode.